People might picture rolling hills and sleepy towns when they think of the South, but there’s way more to the charm of Richmond than that! Home to more than 1.2 million people, Virginia’s capital city—”RVA” to the natives—boasts important American history and contemporary draws side by side. If you’re thinking about moving to Richmond, here are 11 things to know about living in RVA. 1. WORK, LIVE, AND PLAY. Richmond has made several major lists in the last few years that prove it’s a great home for anyone looking to relocate for better employment, family life, and entertainment. In 2013, Richmond made Forbes’ 10 Best Cities for Finding Employment due to its low unemployment rate of 6.2% (which dropped to 5.4% by the end of 2014). The city also made CNN Money’s 10 Hottest Housing Markets for 2014 and is a great place for food lovers, young professionals, and runners. In other words, you can’t go wrong with Richmond! There’s no denying Virginia’s historical significance. After all, eight U.S. Presidents were born in the state! Richmond is home to St. John’s Church, the site of Patrick Henry’s “Give me liberty, or give me death!” speech. This nearly 200-year-old church hosts reenactments of the Second Virginia Convention (including Henry’s speech), as well as a permanent exhibit that explores the history of the area and the events that led to the Revolutionary War. Thomas Jefferson’s famed estate Monticello and living history museum Colonial Williamsburg are just outside of Richmond as well, if you want to learn more about life in the 1700s. 3. THE EDGAR ALLAN POE MUSEUM. Patriots aren’t the only people who might be interested in the history Richmond has to offer. 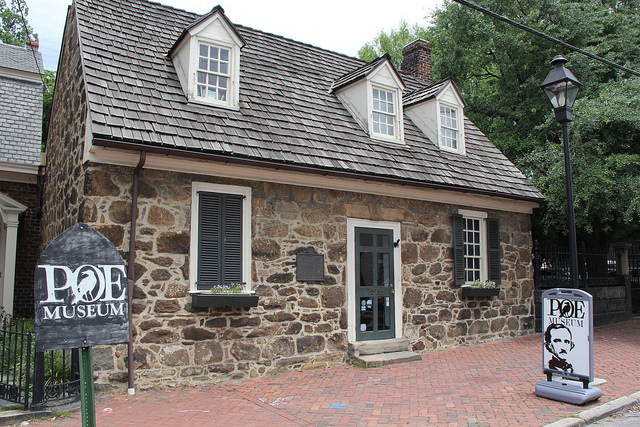 Anyone who loves American literature will definitely enjoy The Edgar Allan Poe Museum, which celebrates the years Poe spent living and writing in Richmond with letters, first editions, furniture owned by him and his sister, and a scale model of Richmond as Poe would’ve known it. The museum even features an “Enchanted Garden,” inspired by a poem of Poe’s, which serves as a beautiful venue for weddings and events. 4. MORE THAN JUST HISTORY AND MUSEUMS. There’s a whole guide to the Richmond destinations by the National Park Service that you can check out, whether you’re seeking out Civil War knowledge at Richmond National Battlefield Park or simply a place to while away the afternoon. Maymont is one such place, a gorgeous mansion, as well as a place to learn and play. The nature center, petting zoo, carriage rides, and gardens all complement the mansion itself, which offers both guided tours and self-guided explorations. There’s always something going on at Maymont, whether field trips for schoolchildren or more grown-up events like the Wine & Beer Classic. Richmond is full of festivals. If you enjoy music and art, check out the Richmond Folk Festival or the Dogwood Dell Festival of the Arts. For something more unique, Richmond’s Carytown Watermelon Festival, which has been an RVA institution for more than 30 years, claims to be the largest one-day festival in the whole state—and it’s all about watermelon! There’s also Walgreen’s Richmond International Dragon Boat Festival, where you can watch as teams of 20 race up the river in canoes decorated to look dragons! Pay the entry fee, and you can even have your own team entered into the festivities. Richmond thrives on the James River, and its proximity to beaches and mountains means no adventure is off-limits. You can swim, sun, kayak, run, fish, climb, and tube without leaving town, and a few hours in the car will land you in the Appalachian Mountains or on a sandy beach. Biking is particularly popular, but if it’s not your speed, there’s always time for a stroll on the Belle Isle Pedestrian Bridge or The Canal Walk. 7. LEAVE BASKETBALL TO THE STUDENTS. The Virginia Commonwealth University is widely adored by basketball fans who are ready for the Rams’s next run at March Madness. The team went to the Final Four in 2011, and while they didn’t end up the victors, Richmond couldn’t be prouder of this hometown team. It’s common for Richmonders to be raised as UVA and Virginia Tech fans, too, but there’s plenty of RVA pride to go around. The University of Richmond Spiders even draw their own hoops crowds, and since Virginian higher education is so widely respected, alumni, current students, and loyal fans all have something to celebrate. Whether you want movies or live, high-caliber performances, Richmond has the venue for you. The Byrd Theatre is a spectacular movie house that was built in the 1920s, retaining every bit of its style and grandeur (including that old-timey sticky floor feel). The Byrd shows second-run movies for much cheaper than chain theaters, by the way. For live performances, The Virginia Repertory Theatre has professional productions of plays and musicals, both classic and contemporary. Also, concert venues like The National or The Richmond Coliseum host tons of can’t-miss entertainment. 9. THE FOOD IS FINGER-LICKING GOOD. Looking for good Southern eatin’? Try the savory burgers at Dots Back Inn, a hole-in-the-wall diner that’s been featured on The Food Network. Or perhaps you want a monster sub from Black Sheep. Of course, you can’t go wrong with Buz and Ned’s Real Barbecue, a Richmond institution that’s been showered with BBQ praise. No matter what you’re in the mood for, Richmond has a local restaurant that can whet your appetite! 10. BUT THE BEER IS BETTER. Richmond is definitely into the craft brewing craze right now, so whatever you fancy, you’re likely to find it! Stop by Legend Brewery, the oldest brewery in Virginia, which offers lagers and ales, as well as a killer view of Richmond’s skyline. Or Blue Bee Cider, Virginia’s only urban cider brewery. Also, be sure to check out Strangeways Brewing, which has the highest rank of Richmond breweries on ratebeer, as well as Hardywood Park Craft Brewery, which scored a perfect 100 on Beeradvocate for its Gingerbread Stout. 11. AND THE DONUTS TAKE THE CAKE. After a night of amazing food and craft beer, is there anything better than a donut? Really, is there anything better under any circumstances than a donut? There isn’t if Sugar Shack is nearby! Richmonders know that these donuts are #1, and even though all donuts are good donuts, there’s really no competition. What do you think? Did we nail everything about life in Richmond? Tell us in the comments! If you’re moving to Richmond and need storage space to help with the transition, view Storage.com’s directory of storage units in Richmond, Virginia. The Fan, TV and Movies filmed in RVA, the murals, the local music (GWAR)….